One of my biggest loves, as most of you probably already know, is interior design and styling. If I wasn’t working in marketing, I would probably have gone down the interior design route as it’s something I spent a lot of time working on back in my college and uni days. 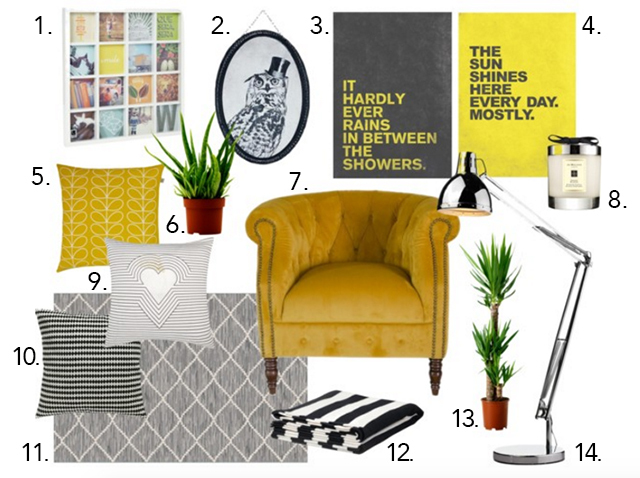 When we found out we would be moving to our new place, all I could think about was how we could style each room. Now with Spring just around the corner I’m itching to get some new bits and pieces to add to the house, especially the living room as it tends to be where we spend the most time. Our colour scheme consists of monochrome with splashes of yellow and metals such as chrome and rose gold, which I love. We have a huge grey sofa which goes with these shades perfectly and is the comfiest thing in the world, but a new arm chair to pull the scheme together in the above gorgeous mustard shade would pull everything together nicely. I’m a huge sucker for cushions, much to Dan’s dismay, and have far too many scattered across the sofa (but omg so pretty). I love the monochrome patterned ones above, set off against the yellow Orla Kiely number. For other soft furnishings, I’ve got my eye on a grey patterned rug, and a striped rug (girl gotta have stripes!). I love all the patterns in the room to be different, yet stick to the same scheme so that they don’t look too fussy or out of place. If that wasn’t enough yellow, I spotted the two prints on a visit to John Lewis just before Christmas that would look amazing side by side above our television where there’s currently a huge blank wall. I love the simplicity of them and the lovely little quotes. Finally, for some finishing touches, I’m obsessed with the huge floor lamp (we have one similar already but this is much nicer! ), the cute little polaroid style photo frame, the framed owl and of course, a good helping of Ikea plants! Do you have a colour scheme in your home? What’s on your homeware wish list right now? "CREATING OUR GUEST ROOM WITH DFS"
I love these choices. I'm really into those chairs with the beaded borders & buttoned backs. We are currently re-decorating & buying cream furniture so I'm thinking about what colours to add with that. This is some nice inspiration!